Cube shelving offers a unique take on modern storage solutions. Instead of a big, bulky cabinet or bookcase, you can arrange the cubes or other modular wall shelving to create whatever design you like and to fit into whatever space you like. You can hang these shelves on the wall, stack them on the floor, or take advantage of vertical space going all the way to the ceiling. You can even arrange them in unique designs. This Modular Corner Cub shelving system features several modular cubes in different sizes that can be stacked on top of each other in different configurations. The cubes can be mounted for stability so that you can play around with the configuration and not have to worry about anything toppling over. These cubes feature a glossy white exterior that is perfect for modern décor, and you can either leave the inside walls white or you can choose colored panels in vibrant pink, bright orange, fresh green or sky blue. The backs of the shelves are left open to reflect the color of the walls in your home. 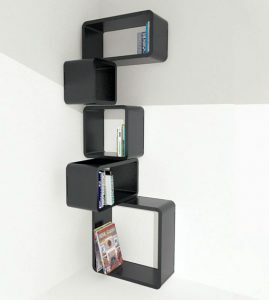 You can also get the shelves in a glossy black finish with the same color options for the inside panels. All the parts snap together for easy assembly and for flexibility in configuration. You may not have much floor space so you want to take advantage of wall space instead. 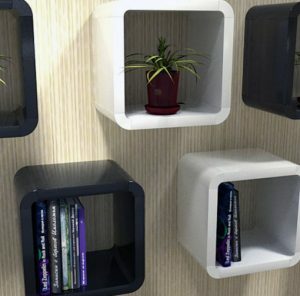 The Unique Cube Wall Shelves allow you to create the same kind of storage as a bookshelf in a small shelving unit that you mount on the wall. These small shelves are 11 inches by 11 inches, which is just enough space for several books, a small potted plant, a framed picture or some of your favorite knick knacks. This cube shelving features the same glossy white or black panel finish as our other modular shelving. The finish is ideal for modern homes, and the simple design with fit right in with the minimalist décor that is so popular right now. Each of these cubes features parts that snap together for easy assembly. You can mount just one shelf right where you need it, or you can hang several shelves together in a group. 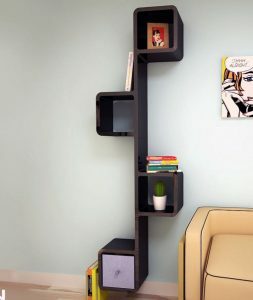 These shelves can be placed anywhere in your home, including your living area, bedroom, bathroom or kitchen. You can even put them in a garage or work area to make the space a little more stylish without being too fancy. The Kong Wall Shelf with Storage has a truly unique design. 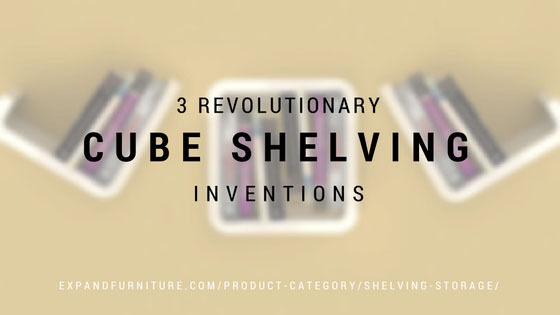 Imagine four of the cube shelves hung separately in a vertical line and then connected by a piece of board – or hung horizontally with the same feature. This modular wall shelving system features the best of both wall shelving and cubes, resulting in a stylish design that will get people talking. You can leave the cubes open to display what’s inside, or you can choose a fabric storage drawer with a knob to keep items hidden. The storage drawer is also useful for items that aren’t really meant to be displayed and that could fall off the shelf, such as pens, remote controls, and other practical items. When the unit is displayed vertically, you can also stack books and décor on top of the cubes. When the unit is displayed horizontally, you can put many more books and décor items on the long shelf, just like you would any wall shelf. Then you would have the cubes for additional storage or to highlight special pieces of art or other décor. 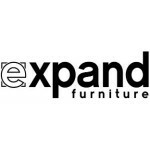 Expand Furniture is pleased to sell these and other modular wall shelving systems to help people make more use of their space and to get the look they want for their homes. 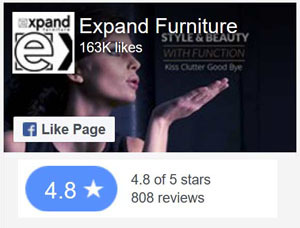 We sell other cube shelving and space-saving furniture options, including transforming tables, Murphy wall beds, storage beds and expanding chairs. 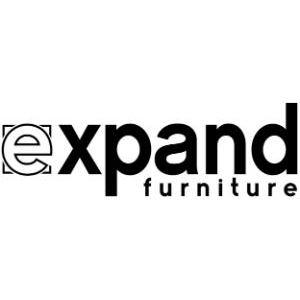 All of our furniture is made of high-quality materials and with expert craftsmanship to achieve a gorgeous design and a long life span. 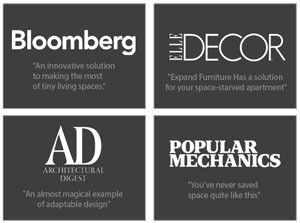 Browse our online catalog to find the space-saving furniture options you’ll love. Contact us today!